Any successful recruitment process is followed by a phase of 'cultural integration'. This describes the process by which a new member of staff adapts to a new organisation, and the particular culture of that organisation. This important step is often overlooked by recruiters, but is gradually growing in importance among human resource professionals. What is an organisation's 'culture'? This is a large question, and a complete answer lies beyond the scope of this introductory guide. Essentially, any close-knit group of people will, over time, develop a set of traditions, customs and unwritten rules that define the ways in which they work together. One of the most stressful times for a newly recruited member of an organisation involves coming to terms with this set of cultural factors, and adapting themselves to work within them. Many of the elements of a culture of this kind are highly specific, and unsuited to assessment through a behaviour-based system like DISC. On a more general level, however, there are often aspects of a culture that suggest an analogy between an individual's approach and the general 'style' of the organisation as a whole. A very formal, rigidly structured working environment could be characterised as a 'High-C' organisation, for example, while a workplace that placed emphasis on personal initiative and internal competition would be more appropriately described as a 'High-D' organisation. By comparing a new recruit's behavioural style with that of the organisation, we can highlight those areas where they will have difficulty in adapting to their new environment, as well as discovering those areas in which they are particularly well suited. Using this information, it becomes possible to guide an individual's induction into a new organisation, rather than simply leaving them to 'fit in' as well as they can. 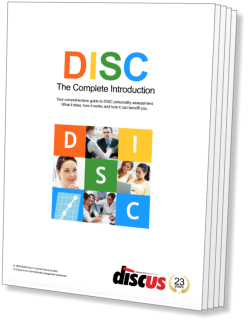 Achieving this in an effective manner clearly takes a great deal of skill, experience and patience, and this is perhaps the reason why this application of DISC is comparatively rare in comparison with its other uses. Nonetheless, it is an unavoidable fact that many individuals who might be otherwise suited to a job leave in the first few months, and this points to the need for greater attention to the 'cultural integration' phase.